Who says, men can not try beauty and grooming products? I think they need more than us, well, sometimes. My cousin is a sportsman and has to spend the major part of his day outdoors.As a result he had got a terrible tan on his face, specially the forehead. 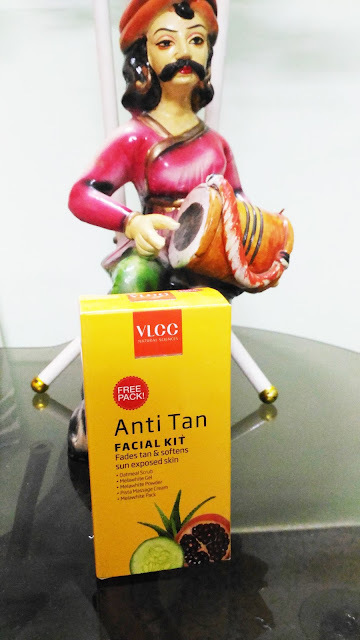 As a caring elder cousin, I decided to get rid of the tan from his face and I took the help of VLCC Anti-Tan Facial Kit. Pistachios, nutmeg, oatmeal and cucumber are not just nutritious snacks for your diet; together they can form a super skin care regime that can give you a healthy, youthful complexion. Recognizing the benefits of these natural ingredients, VLCC has blended them with other plant-derivates like Aloe Vera and Wintercherry extracts to create this effective face treatment that gently fades tan and heals and softens sun-damaged skin. Packaging: The VLCC Anti-Tan Facial Kit comes in a yellow cardboard packaging. Inside there are 5 sachets with step by step instruction. Experience: As I said my cousin had a terrible tan, so I was not expecting a miraculous result with the VLCC Anti-Tan Facial Kit. 1.Oatmeal Scrub: This is a gentle exfoliator that can be mixed with water to get a smooth paste. It has to be applied evenly and kept for 2 minutes and then massaged gently for another 2 minutes and rinsed off. 2.Melawhite Gel: This gel, enriched with cucumber and aloe vera, helps to remove dead cells from the skin and gives it hydration. It should be massaged gently on the skin till it gets absorbed. 3.Melawhite Powder: This powder, infused with antioxidant properties of pomegranate has to be mixed with water and applied on the skin as a pack. Should be removed after 10 minutes. 4.Pista Cream: Enriched with Vitamin E, this cream should be massaged on the skin for 15 minutes. 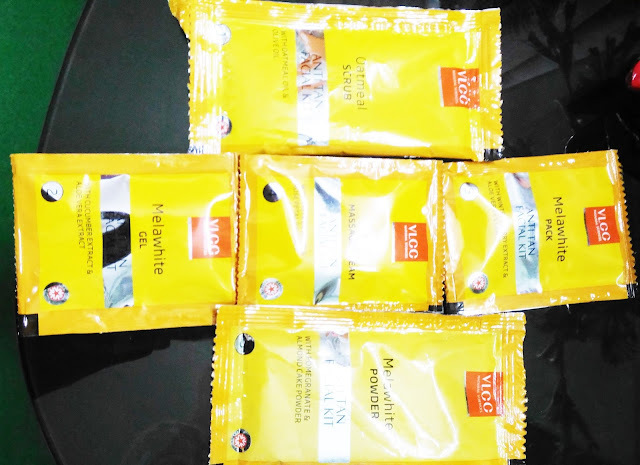 It protects the skin and helps improve complexion. 5.Melawhite Pack: Wintercherry and aswagandha, in this pack make sthe skin bright and radiant. It should be applied evenly and kept for 15 minutes before rinsing off. Overall the result of the facial with VLCC Anti-Tan Facial Kit was quite satisfactory. Just one session with the kit improved my cousin's complexion to a great extent. He was so impressed that he decided to use it every month. 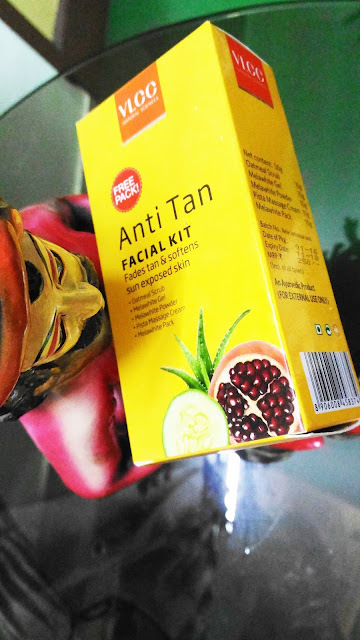 VLCC Anti-Tan Facial Kit is a very effective "at-home" facial kit, that not only helps remove tan but also brightens and improves the complexion. Labels: anti tan, at home facial, ban tan, Beauty, Facial, facial kit, Home, men skin care. best tan removal, Reviews, vlcc facial.